Here are brief accounts of people who have lost their loved ones due to reckless car crashes. If you have any stories to tell please share with us. I remember 27th April 1984, the day which have changed my life. I was then merely 13 yrs at age. My father who was around 45 age died in an road accident on Indian road near a village of Bhandara near Nagpur city in Maharashtra. I was having a responsibility of my own as well as two sisters who was 14 & 8 respectively and mother. 26 years has been passed since then, but there is hardly any single day which I forget to recall the memories of the past. Due to a single incident of the life, I have not only lost father, but my childhood. I sometime narrate my story as, a fathers death is a son funeral. Since that day God has put me constantly on tests after test, today at 40, I am still struggling to cope with the loss done. This would have not happened if little care was taken by someone who caused that accident to happen. 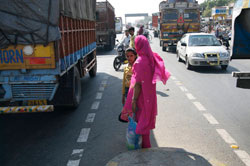 According to WHO, 9 in 10 road deaths and injuries occur in developing countries. Research in India and Bangladesh has shown that at least half of families affected by a road death or serious injury fall below the poverty lineas those who lose their lives are breadwinners. If you or somebody you know have lost loved one in an accident please share with us.